In a large mixer bowl, place instant pudding, sour cream, milk and orange peel. Beat at low speed until thick and well blended (1 to 2 minutes). By hand, fold in whipped cream. 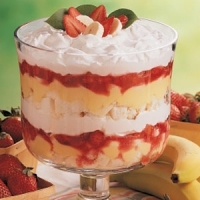 In trifle bowl, layer 1/2 of cake pieces, 1/3 strawberries and 1/2 of pudding mixture. Repeat layers. Arrange remaining strawberries on top. Cover. Refrigerate at least 2 hours. Serves 8. 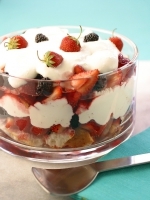 Recipe categories: Desserts, Strawberry, Berries.